Therapy Chicago: What is Emotional Intelligence? What is Emotional Intelligence, and How Can I Implement It in My Professional Life? I work with many clients who are incredibly stressed in their professional lives, including having challenging colleagues or not getting along with their boss. When talking with them, I help them discover what kind of coping skills can help them with their day-to-day professional stressors. It is very common to feel overwhelmed while at work, especially if you have a work culture environment that is less than ideal. 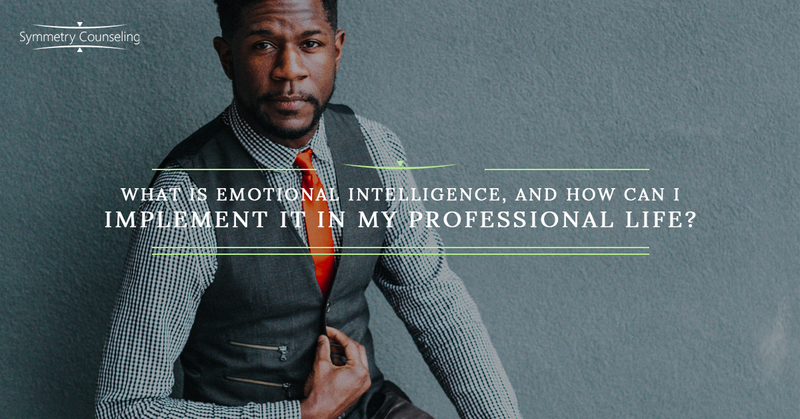 One thing I commonly bring up to my clients is assessing their emotional intelligence, as that is a crucial starting point when facing stressors at work. Below is a simple guide why it is important to utilize your emotional intelligence while at work based on Dr. Orbé-Austin’s clinical recommendations. Reframe your feelings. Sure, if you are stressed or sad while at work, it is okay to feel that, but think of the outcome of your feelings will have on your actions. This requires emotional discipline. It won’t help you (professionally) in the moment to storm off in tears at work if given negative feedback. What will help you professionally is to acknowledge what your boss said without having an emotional outburst. Is that really a good idea? While I truly am an advocate for allowing yourself to feel what you are feeling, I also think there are appropriate times, places, and people to share that with, especially in your professional life. If you truly do trust that a colleague won’t go back and repeat a shared conversation to your boss, maybe that calls for a 10-minute coffee break or lunch break with them to allow yourself to process the negative feedback you just received. If you don’t know if you can share with a colleague, then calling a friend or even talking with a therapist is an amazing way to process a stressful event at work. How can I become emotionally disciplined? Well, it takes a lot of work. If you truly want to work on your emotional discipline, it requires much reflection time to allow yourself to better understand your own thoughts and feelings and the actions that go with them. For some, they can do this through journaling, talking to their friends, significant others, or their families. And for others, perhaps meeting with a therapist can also help with self-discovery. In the moment of stressful events, Dr. Orbé-Austin recommends meditation or deep-breathing exercises to re-center yourself. Search for your Inner Peace. Baseball player Mariano Rivera states, “I am convinced that being fully committed to the moment, without any worries about the past or projections into the future, is the best attribute a closer can have.” His words are very insightful. Essentially through mindfulness techniques, we can be more emotionally intelligent, especially while under much professional pressure. While this guide provided reasons to utilize your emotional intelligence while at work, try to focus on the one(s) that you think will help you most, as you truly know yourself more than anyone else. Once you identify what works best, try to be consistent with it. If you are currently struggling with professional stressors or understanding your own emotional intelligence, it may be a good idea to connect with one of our skilled counselors at Symmetry Counseling today. You can contact them at 312-578-9990 to set up an appointment.